As I toyed with the idea of starting a blog, several topics sprang to mind, but maintaining one’s language skills seemed the most appealing to open this new endeavour. The years I spent in the foreign language classroom with my adult students – as well as my own lifelong experience as a learner – have definitely equipped me with no shortage of ideas to stay linguistically active and exposed to the foreign languages I have put so much effort into. As a translator, being up to speed with Spanish, my native language, is also extremely important, so in this respect, there is no real difference between acquired and learned languages. What I always told my students is that English or Spanish (depending on which I was teaching) wasn’t a suit they put on as they crossed the threshold of the classroom door and took off when they stepped back into their busy lives. A language becomes our companion, a new way of expressing ourselves, regardless of our level of proficiency. As such, we have to integrate it in our lives, just like our mother tongue: as a natural, almost invisible ‘thing’ that happens. Most people don’t pay the slightest attention to language when they change their Facebook privacy settings or quickly jot down a shopping list before heading to the shop, but language is there, too, and not only in books or blogs. Well, what if that language was the one we are learning? After a while, it becomes a habit, another invisible ‘thing’ that works as a vehicle for a greater end and not as the end in itself. So, let’s bring our foreign languages into our everyday life! How? Let me give you some ideas. It’s impossible to ignore that we live in the era of smombies. We are under the spell of smartphones, but also tablets and computers. Surely we can use them to achieve our language goals. One of the settings hiding in your device knows how to play a magic trick: it can change the language! If your level of proficiency isn’t up there yet and you get a new phone or tablet, or you start using a new social network, maybe it would be sensible to wait until you feel comfortable with the interface and then, bang! Change the language. I switch mine all the time. Right now, my Facebook begrüßt mich in German, which helps me remember little words like ‘sign in’ or ‘settings’; my Twitter is in español, my LinkedIn in English, and my iPod doesn’t play music, it plays de la musique. Don’t stop at the most obvious, I’m sure you use state-of-the-art watches, MS Word, or e-books. 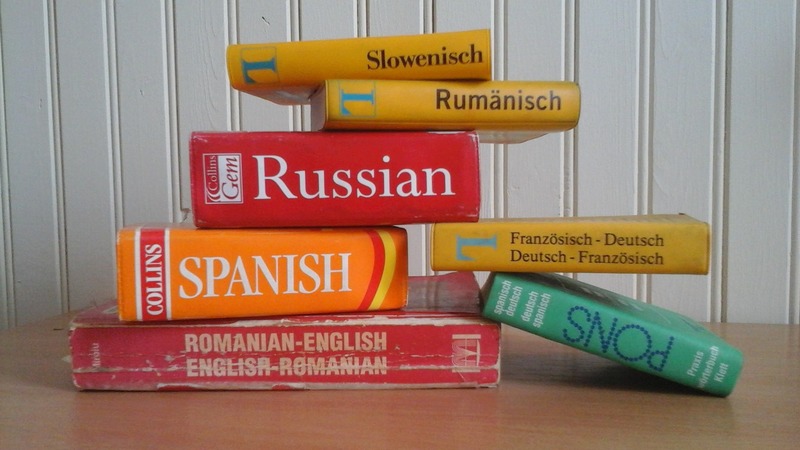 Use them to learn a language, too! Additionally, join Facebook groups in your target language about topics you’re interested in. You’ll kill two birds with one stone: learning about something while being exposed to the language. Likewise, follow people on Twitter who tweet in your target language. These little snippets that try and say a lot in a few characters can be linguistically challenging, sort of like newspaper headlines. Another aspect of everyday life is food. We are all hungry (especially after translating for a few hours!). When your fridge is looking sad, I bet you go to the supermarket. You probably don’t leave the house without a shopping list, right? Yes, you guessed it, write it in a language that can teach you something, or help you review old vocabulary. I live in England, which means I see lots and lots of English on packages, jars and signs. To make up for that, I write my list in any of my other three languages, or I try. Frankly, I scribble down whatever comes to mind first, which is how I’ve learned to operate, juggling words in my head in no matter which language. The fastest one to reach the door is the one that comes out. Here is a picture of the cheat sheet that will guide me along the supermarket aisles on my next trip. As you can see, German is the strong suit. This is how I keep up with my Lebensmittel vocab! 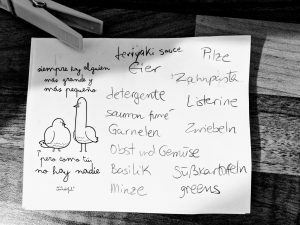 While in the kitchen, and if you’re a cook at all, try and use recipes in different languages: this helps you with culinary terms, but also with imperative forms and measurements like ‘tablespoon’ or ‘pinch’. Appointments, courses, deadlines, meeting friends… It’s hard to keep track of it all, that’s why you use a planner, diary or calendar (paper or digital). Make sure you can get some linguistic benefit from being organised and use tools in the target language. As a plus, if you use a planner you bought in Germany, for example, you’ll learn about German national holidays. 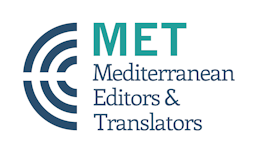 If you are a translator, this might help you remember why a German client is not responding on 3 October, or a Spanish one on 6 December if your planner came from Spain. Listen, listen, listen! The internet is an excellent source of material and we must take advantage. Most radio stations have podcasts available for download, for free. You can find podcasts on any topic you are interested in, no subject is too weird. For German, my favourite when I started was Radio D (Deutsche Welle); for French, I have two favourites on France Inter: On va déguster, which I recommend if you want to keep up with your culinary vocabulary, and Si l’Amérique m’était contée, amazing for auditory exploration of the US, but unfortunately not longer on the air; and for English, BBC 4’s Museum of Lost Objects is good for history, art and preservation. As for translation podcasts, I’ve found a decent number. Just go to iTunes and do a quick search; try a few until you find a match! I personally like Speaking of Translation. The good thing about podcasts is that they travel with you. Just download them to your phone or iPod, even easier if you subscribe, and off you go to walk your dog, take the Tube or buy groceries. Audiobooks are also great to refine your listening skills, and they’re perfect for long journeys, especially if you get sick when reading while on the move. Chew the fat – or the cud – but chew! Speaking tends to be many language learners’ bête noire, and it’s true that it can be daunting. However, we need to overcome this fear, and the sole way is through practice; the more, the better. Find speaking groups in your area (Meetup is popular in many cities), arrange Skype or face-to-face conversation lessons, or find a speaking mate to meet for coffee and agree to speak 50% of the time in each language (in London, I’ve used Conversation Exchange). Not really keen on other humans? Speak to your pet in Spanish, Italian, Russian… They are (most likely) not going to rebut you! When I speak to my cat, code-switching is king. But he understands, all the time! Do it with your dog, cat, or goldfish. It’s a way to practise in a safe, non-assessed environment: your home. Fun and culture can also open the door to linguistic knowledge. Visiting a local museum or taking a trip somewhere? Learn about the exhibition or the history by getting an audio guide or printed brochure in the target language, if it’s available. Dining in a Greek restaurant or buying from a Mexican shop, if run by natives, is a great opportunity to order in Greek or Spanish, but also to make some small talk and learn about the culture. I have left out the most obvious, receptive ways to maintain language skills, namely reading (papers, books, or magazines), listening to music (lyrics), and watching films or TV. These classics work wonders to expand vocabulary and tune the ear. So, how do you care for your language skills? Whether you are a translator, a language teacher, a student, or just a language lover, I’d love to hear from you. Share your secrets to stay up to speed with your languages! Carolina, the post is really great! Oh, I loved the idea of changing the settings in social networks, etc.! And now I can’t understand why I could not think of it myself, though the idea is so obvious and really brilliant ))) All those little things like “home page” or “copy and paste” in different languages! Thanks for this piece of advice, it is sure to help me. As for my private tricks that I sometimes keen on using, there is one that may seem silly but for me it works 🙂 When I am relaxed and nothing bothers me (while on a long train trip or waiting in a queue), I usually let my thoughts wander from one topic to another and then try to translate these chaotic sentences into a target language. “Oh, look at that strange hair colour of the woman. By the way, I need to make an appointment with my hairdresser. And what colour does “moire” actually mean? In which book have I met this term? Don’t remember…” Almost disconnected thoughts but they help me find out what vocabulary I need to revise or if I know how the perfect tense is created in, say, Hindi. Hey Carolina! I totally agree with Alla about switching your social media accounts into a different language. I’ve had my FB in Portuguese since I read your post and don’t think I’ll be switching it back anytime soon. My tip to share with you is to write quotes, idioms, sayings or anything else, on your mirror with liquid chalk pens in your favourite language(s). I’m lucky to have a huge bathroom mirror and love combining a bit of creativity decorating it with language learning. As Alla says, keep on writing and inspiring us all. “A language becomes our companion, a new way of expressing ourselves, regardless of our level of proficiency. As such, we have to integrate it in our lives, just like our mother tongue: as a natural, almost invisible ‘thing’ that happens”. I think I will integrate a couple of your suggestions into my daily life. Hi Carolina, great post! I think I do most of these too – always trying to find a way to incorporate my languages into the everyday. I speak to my toddler in Italian, which a lot of people think is bonkers since it’s not my mother tongue, but as well as teach her the rudimentaries (she understands everything), I’ve learned a lot about the language of parenting which I hadn’t learned before. One thing that has really helped me is translating articles in my foreign languages and uploading them to italki. I often choose interesting journalistic articles so it really helps me work out how to express myself better. Your texts then get corrected by natives. It’s great for identifying weaknesses, even though sometimes getting a text back full of red corrections can be a bit ego-deflating! I love the idea of talking to your toddler in Italian. The earlier she learns the basics, the better. This way she won’t look at Italian as a foreign language but as another way of playing and communicating with you.